Technology and investments related to Korea’s competitiveness in the “fourth industrial revolution” is far behind other advanced countries such as the United States, Japan and Europe, according to the Hyundai Research Institute. The institute released a report on the international comparison of the research and development status of industries based on the fourth industrial revolution Monday, revealing that Korea’s total score for industrial technology evaluation was 77.4 points out of 100 -- a 22.4 point gap compared to the US, which was top with 99.8 points. Europe reached No. 2 with 92.3 points, followed by Japan with 90.9 points. China’s fourth industrial revolution development status was evaluated at 68.1 points. The report calculated scores based on a nation’s development according to five detailed industry-specific scores: IT services, communication services, electronics, mechanical equipment and biomedical products. Korea achieved its highest score of 79.4 in the field of electronics, which includes the development of devices such as semiconductors, electronic components and computers. In contrast, the country’s IT service field score, which includes computer programming, data processing, IT consulting and data processing, recorded the lowest score at 76.4 points. Regarding fourth industrial revolution-based industries, data showed that a total of 750 intellectual property patents were registered in Korea. This only accounts for roughly one-seventh of the total patents registered in the United States or Japan, which recorded a total of 5,240 patents and 5289 patents, respectively. China accumulated a total of 674 patents. Despite Korea achieving its highest industrial development scores in electronics and IT services, the nation still raked in fewer IT service-related patents compared to its Asian neighbor. China’s total number of IT-related patent registrations was 153, while Korea had 134. 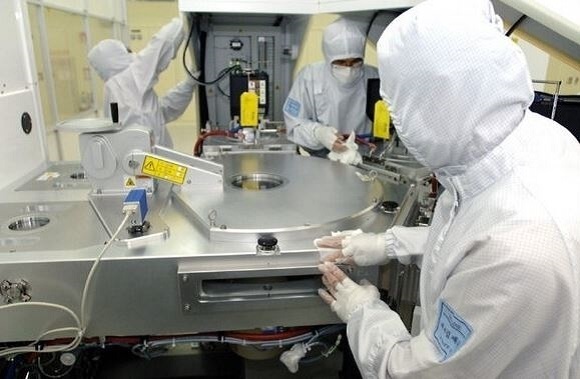 According to the report, the majority of Korea’s industrial investments are concentrated in the electronics sector, while investment in IT services, biomedical and telecommunication services remain relatively low. While the country’s fourth industrial revolution development score in the IT, biomedical and telecommunications service sectors averaged 77 points, compared to the US’ average score of 99.8, the investment ratio for all three fields combined accounted for less than 20 percent. Telecommunications accounted for 13.1 percent of total investments, followed by biomedical at 2.3 percent and IT services at 1.7 percent. Investments in electronics totaled 43.1 percent. Looking to further expand investment in the field of electronics, the world’s leading semiconductor manufacturers Samsung Electronics and SK hynix announced Monday they would invest a combined 36.9 trillion won ($32.8 billion) in the industry by 2024. Samsung Electronics, the world’s No. 1 chip provider, revealed the company plans to invest 21.4 trillion won, while SK hynix is set to invest 15.5 trillion won in the country’s burgeoning flash memory chip sector.